In ViewController.swift you will be able to change the cards displayed and/or their order by commenting out one of the loadCards(cards: ) functions. If you want to change the content of any of these cards, you can look into each of the CardPartsViewController you pass into the function such as: TestCardController, Thing1CardController, Thing2CardController, etc. If you need help, open an issue and tag as help wanted. In order to submit a pull request, please fork this repo and submit a PR from your forked repo. Have a detailed message as to what your PR fixes/enhances/adds. Each PR must get two approvals from our team before we will merge. 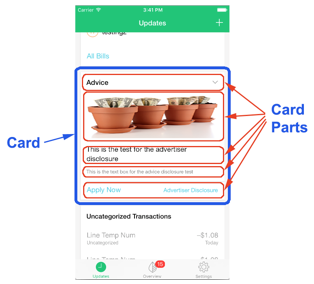 CardParts is the second generation Card UI framework for the iOS Mint application. This version includes many updates to the original card part framework, including improved MVVM, data binding (via RxSwift), use of stack views and self sizing collection views instead sizing cells, 100% swift and much more. The result is a much simpler, easier to use, more powerful, and easier to maintain framework. This framework is currently used by the iOS Mint application and the iOS Turbo application. There are two major parts to the card parts framework. The first is the CardsViewController which will display the cards. It is responsible for displaying cards in the proper order and managing the lifetime of the cards. The second major component is the cards themselves which are typically instances of CardPartsViewController. Each instance of CardPartsViewController displays the content of a single card, using one or more card parts (more details later). The CardsViewController uses a collection view where each cell is a single card. The cells will render the frames for the cards, but are designed to have a child ViewController that will display the contents of the card. Thus CardsViewController is essentially a list of child view controllers that are rendered in special cells that draw the card frames. The viewController() method must return the viewController that will be added as a child controller to the card cell. If the CardController is a UIViewController it can simply return self for this method. MyCard will now render itself with a transparent card background and frame. No extra code is needed, just adding the TransparentCardTrait as a protocol is all that is necessary. Most traits require no extra code. The default protocol extensions implemented by the framework implement all the code required for the trait to modify the card. A few traits do require implementing a function or property. See the documentation for each trait below for more information. By default each card has margin at the top and bottom of the card frame. Adding the NoTopBottomMarginsCardTrait trait will remove that margin allowing the card to render to use the entire space inside the card frame. Each card is rendered with a frame that draws the border around the card. Adding TransparentCardTrait will not display that border allowing the card to render without a frame. If the EditableCardTrait trait is added, the card will be rendered with an edit button in upper right of the card. When user taps in the edit button, the framework will call the cards onEditButtonTap() method. The EditableCardTrait protocol requires the CardController to implement the onEditButtonTap() method. The framework will then observe the isHidden variable so that whenever its value is changed the card will be hidden or shown based upon the new value. This allows the CardController to control its visibility by simply modifying the value of its isHidden variable. The ShadowCardTrait protocol requires CardController to implement shadowColor(), shadowRadius(), shadowOpacity() and shadowOffset() methods. // The value can be from 0.0 to 1.0. Use this protocol to define the roundness for the card by implementing the method cornerRadius(). Use this protocol to add a gradient background for the card. The gradients will be added vertically from top to bottom. Optionally you can apply an angle to the gradient. Angles are defined in degrees, any negative or positive degree value is valid. CardPartsViewController implements the CardController protocol and builds its card UI by displaying one or more card part views using an MVVM pattern that includes automatic data binding. Each CardPartsViewController displays a list of CardPartView as its subviews. Each CardPartView renders as a row in the card. The CardParts framework implements several different types of CardPartView that display basic views, such as title, text, image, button, separator, etc. All CardPartView implemented by the framework are already styled to correctly match the applied themes UI guidelines. The above example creates a card that displays two card parts, a title card part and a text part. The bind calls setup automatic data binding between view model properties and the card part view properties so that whenever the view model properties change, the card part views will automatically update with the correct data. The call to setupCardParts adds the card part views to the card. It takes an array of CardPartView that specifies which card parts to display, and in what order to display them. This will make the card a full screen view controller. So if you do not want to build with an array of Cards, instead you can make a singular card full-screen. The framework includes several predefined card parts that are ready to use. It is also possible to create custom card parts. The following sections list all the predefined card parts and their reactive properties that can be bound to view models. 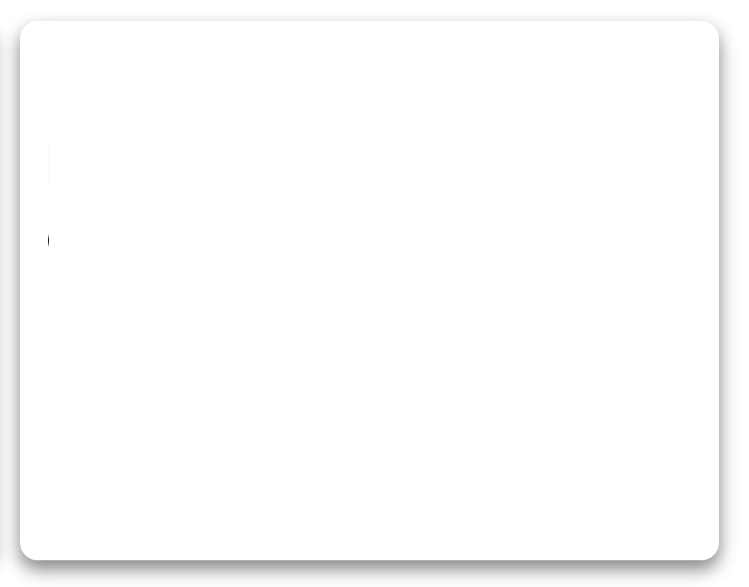 CardPartTextView displays a single text string. The string can wrap to multiple lines. 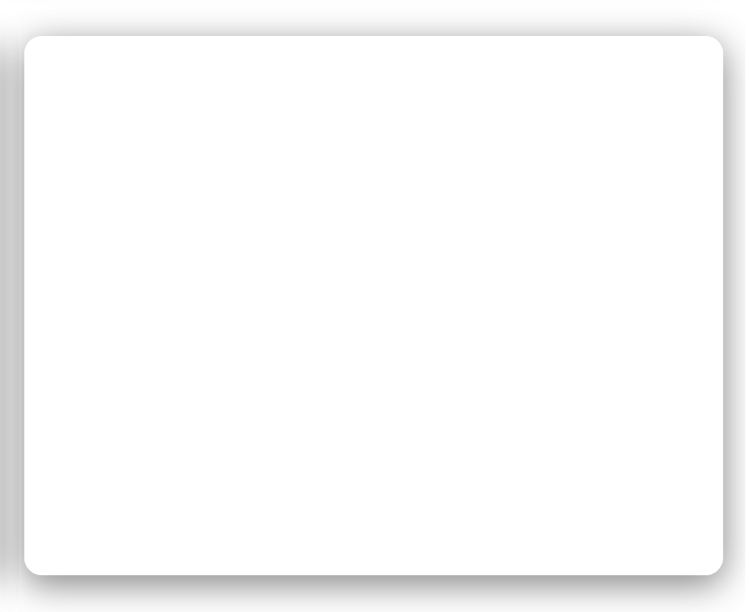 The initializer for CardPartTextView takes a type parameter which can be set to: normal, title, or detail. The type is used to set the default font and textColor for the text. CardPartButtonView displays a single button. CardPartTitleView displays a view with a title, and an optional options menu. The initializer requires a type parameter which can be set to either titleOnly or titleWithMenu. If the type is set to titleWithMenu the card part will display a menu icon, that when tapped will display a menu containing the options specified in the menuOptions array. The menuOptionObserver property can be set to a block that will be called when the user selects an item from the menu. titlePart.menuTitle = "Hide this offer"
See the example app for a working example. CardPartSeparatorView displays a separator line. There are no reactive properties define for CardPartSeparatorView. CardPartStackView displays a UIStackView that can contain other card parts, and even other CardPartStackViews. Using CardPartStackView allows for creating custom layouts of card parts. By nesting CardPartStackViews you can create almost any layout. There are no reactive properties defined for CardPartStackView. However you can use the default UIStackView properties (distribution, alignment, spacing, and axis) to configure the stack view. CardPartTableView displays a table view as a card part such that all items in the table view are displayed in the card part (i.e. the table view does not scroll). CardPartTableView leverages Bond's reactive data source support allowing a MutableObservableArray to be bound to the table view. The last parameter to the bind call is block that will be called when the tableview's cellForRowAt data source method is called. The first parameter to the block is the MutableObservableArray being bound to. CardPartTableView registers a default cell class (CardPartTableViewCell) that can be used with no additional work. CardPartTableViewCell contains 4 labels, a left justified title, left justified description, right justified title, and a right justified description. Each label can be optionally used, if no text is specified in a label the cell's layout code will correctly layout the remaining labels. It is also possible to register your own custom cells by calling the register method on tableViewPart.tableView. Next, create a data source that you will bind to you data: Note: You can create a custom CardPartCollectionViewCell as well - see below. CardPartTextField can take a parameter of type CardPartTextFieldFormat which determines formatting for the UITextField. You may also set properties such as keyboardType, placeholder, font, text, etc. CardPartOrientedView allows you to create an oriented list view of card part elements. This is similar to the CardPartStackView except that this view can orient elements to the top or bottom of the view. This is advantageous when you are using horizontal stack views and need elements to be oriented differently (top arranged or bottom arranged) relative to the other views in the horizontal stack view. To see a good example of this element please take a look at the example application. Add the above orientedView to any list of card parts or an existing stack view to orient your elements to the top or bottom of the enclosing view. rightTextCardPart.text = "Right text in a label"
leftTextCardPart.text = "Left text in a label"
A CardPartCenteredView can take in any card part that conforms to CardPartView as the left, center, and right components. To see a graphical example of the centered card part please look at the example application packaged with this cocoapod. emptyText.text = "No data found." customText.text = "I am some custom state"
Now, whenever the view model's title property value is changed it will automatically update the titlePart's title. RxSwift use the concept of "Disposable" and "DisposeBag" to remove bindings. Each call to bind returns a Disposable that can be added to a DisposeBag. CardPartsViewController defines an instance of DisposeBag called "bag" that you can use to automatically remove all your bindings when your CardPartsViewController is deallocated. See the RxSwift documentation for more information on disposables and DisposeBags. And then in your AppDelegete call YourCardPartTheme().apply() it apply your theme. and the ratio of its container that the card takes up. Any view controller which is a subclass of CardPartsViewController supports gesture delegate for long press on the view. Just need to conform your controller to CardPartsLongPressGestureRecognizerDelegate protocol. When the view is long pressed didLongPress(_:) will be called where you can custom handle the gesture. Example: Zoom in and Zoom out on gesture state begin/ended. You can set the minimumPressDuration for your press to register as gesture began. The value is in seconds. default is set to 1 second. // Gesture starts registering after pressing for more than 0.5 seconds. CardParts is available under the Apache 2.0 license. See the LICENSE file for more info. Swift 5.0 and Xcode 10.2 support release.